Submitter: I found this gem of a cookbook (if we can even call it that) at a library booksale. All of the recipes involve canned foods; one of my favourites, found in the “Vegetables” section, is a mushroom meatloaf. There is also an entire section devoted to recipes that involve SpaghettiOs. I’m getting some ideas for a dinner party – hoping my hubby can handle cooking SpaghettiO Western and Cansicles. They look deeeelicious! I worked at a bookstore when this book came out… sadly, it has sequels! I’m pretty sure they’re being ironic. Sorry but there is nothing wrong with this book. I know guys who are great cooks, but I also know a guy who lived on delivery pizza for years because he was so terrified of cooking and was absolutely convinced he couldn’t do it. He got this book and it was accessible to him BECAUSE it was simple and used familiar canned ingredients. And, at the time, it was one of the only books out there targeted at men who are afraid to cook, taking them in babysteps to the kitchen without a lot of unfamiliar cooking language. As far as the health factor and SpaghettiOs, read the orange box in the second photograph; it explains why they’re used. Every recipe has the nutritional info right there, and apart from the sodium, these all look fine. Never mind the sexism and obvious health concerns. These dishes just look disgusting. Once you’ve passed the age of five, you should have a mature enough palate to avoid SpaghettiOs. It’s not that hard to cook up some dried pasta. I have a friend who got this as a gag gift. And that’s all it’s good for: looking at once, laughing, and tossing. I assume ‘veggies’ is not actually implying vegetarian food there? Those desserts actually look good though. The idea of spaghettiOs and black beans together sounds incredibly gross. And chocolate chip cookie dough and cherry pie filling is classified as fruit? This is a collection of columns from the magazine. The intent isn’t to cook this day every day, but they’re easy-to-make fast recipes with full nutritional information. It’s not targeted at one of the best cooks you know, it’s targeted at the worst — and at those who don’t always have access to fresh ingredients. So why would you weed this, other than expert cooks not liking it? It’s not out-of-date, other than the sodium levels (gah!) it’s not unhealthy, and it has a pretty well-defined target audience. It’s 43 board pages so it’s not taking up much space. I have to admit that it feels a little bit classist to me. This was published in 2002? I was thinking more 1950s-1970s. As far as the date goes (2002 right?) it isn’t an unreasonable date for a cook-book, and as far as the recipes looking disgusting, I’d just like to say that the “plating” of the dishes is awesome! Not that the average audience for this book would take that amount of effort. I own this book and its sequel. Quite a few of the recipes are really good. But the second book is better. My library has this book, and it’s currently checked out! I appreciate the need for titles for people who are completely intimidated by the kitchen, but the OF COURSE men can’t cook! They’re MEN! vibe is pretty off-putting. There are more gender-neutral titles out there that might be more appropriate for a general library (“Help! My Apartment Has a Kitchen!” is the fave of one 20-something guy I know). @Chris–I don’t think taste has any age limit. Plenty of people over age 5 like SpaghettiOs (and I’m pretty sure the target age range goes higher than that, anyway…probably more like 10). Most college students would probably be thrilled if you gave them a can of it. And I don’t really see what’s wrong with it, anyway. So it’s pasta in a can…so what? 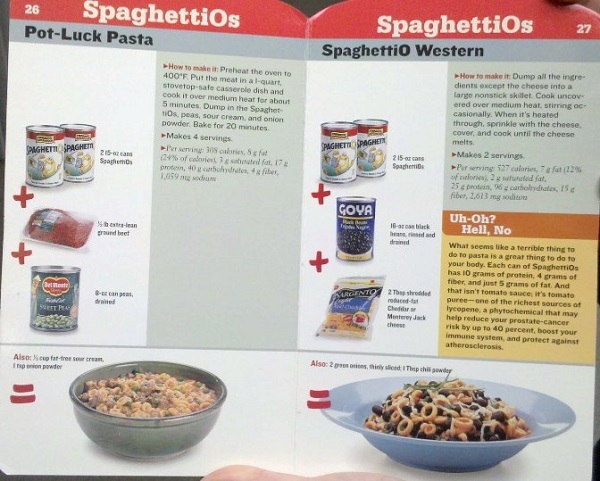 As far as the recipes go…the idea of mixing black beans with SpaghettiOs sounds kind of gross. None of the ones pictured sound very good, actually, except the desserts. I’m okay with the desserts. I’m pretty sure my mother has this book (bought for either me when I started college a couple years ago or my father, not that either of us would ever use it), but in her defense she has dozens (possibly even hundreds) of cookbooks that have probably never been used. When you don’t have a lot of kitchen space or utensils, and especially if you’re feeding under-twelve-year-olds, SpaghettiOs can look mighty appealing. So when will libraries need to weed the 2008 “Don’t fill up on the antipasto : Tony Danza’s father-son cookbook”? Some books you know are not going to last long. I’m really not seeing the problem with it. It’s recent enough that most, if not all, of the products in the recipes are still on the market. And it’s a good gimmick for people completely new to cooking, people afraid to get into cooking, and people who primarily buy canned foods (canned foods are often crazy cheap). Bradley is absolutely right about the food pantry. My dad has managed a church food pantry for years, and canned or prepared foods are always what go first and what they need the most of. Many low-income people don’t have the time, money, equipment, or background in cooking needed to be more adventurous in the kitchen. Also, my husband would love this book. I’m going to try to find a copy. No, you wouldn’t want to eat these things every day, but this would definitely fill a need for some people. My husband is willing to cook but gets very stressed in the kitchen and doesn’t like working without a recipe. Therefore, most of what he cooks is Macaroni Grille box dinners, pasta, or hamburgers on the Foreman grill. A little variety would be nice, and you could use fresh substitutes for some of the canned stuff recommended here. I’m just sort of surprised at the existence of chocolate syrup in a can. I’ve only ever seen it in squeeze bottles. My boyfriend, who is a fabulous cook, actually owns this. When I teased him about it, he said that a couple recipes aren’t too bad and it’s of good use when you don’t have much in the house. I’m suspicious of any recipe that instructs me to “dig” something out of a can and then “dump it” into a blender. As a poor student with little time (and usually a messy kitchen) this sounds great for those times when you need something quick, simple, and largely made of non-perishables. As a book for those afraid of cooking, it looks helpful, but to make it more helpful there should be lists of how you could jazz things up a bit. I just love the masculine language. 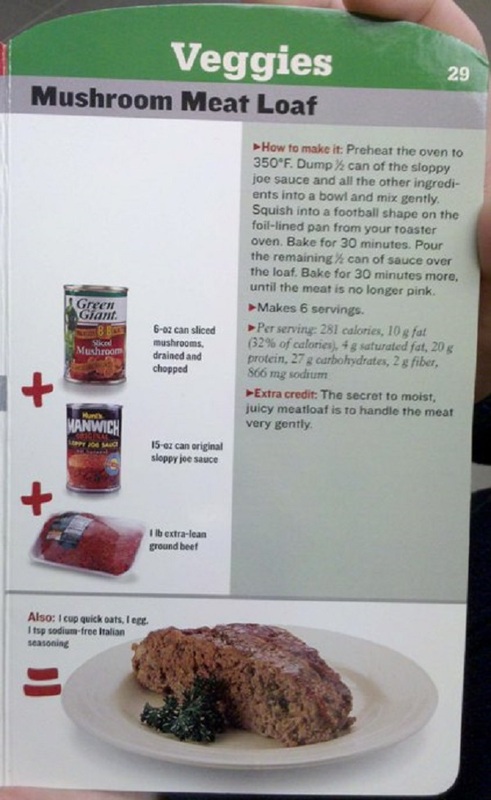 “Dump in can” “Shape into football” use the “foil lined pan from your toaster oven”. Sheesh. Me man. Me can cook meat! @Kristin – I don’t see the problem with a few informal verbs. In fact, I highly doubt that anyone buying/checking out a cookbook with cardboard pages that instructs you on how to cook with SpaghettiOs is going to mind a little bit of informal language. I’m a man and a pretty good cook and I don’t see anything particularly wrong with this book. I have a number of friends who don’t cook and are intimidated by the prospect of doing anything more complicated than microwaving Hot Pockets. They are this book’s target audience, not great cooks or frown at the use of canned ingredients. If this book is getting them to lay off the fast food and take a little more interest in what they eat, I’d say it’s doing its job and deserves to be kept. On the other hand, I would question the efficacy of a cookbook targeted at people who don’t read cookbooks as it seems unlikely, especially in a public library, to find its way to those who need it. I would be curious to know how well circulated this title is. If you give this book to someone along with a can opener, is it a gift set? For people who don’t know/are afraid to cook, there are tons of three or four or five-ingredient cookbooks that would provide a much better grounding and be a lot less gross. I’m astonished that this book was published within the last ten years. It’s the sort of thing that might have been aimed at men about 30 years ago. Hey! Their Tijuana Mac and Beef is a favorite recipe of mine to this day! 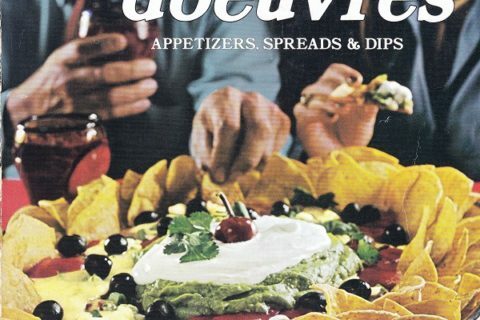 A boyfriend of mine came with this book, and though the recipes required several substitutions (canned veggies for fresh, usually), some of them were pretty good. My Dad got this book as a birthday gift, when a well-meaning relative found out that he was doing most of the cooking around the house during a period when he was in between jobs and my Mom was working. My Dad was actually insulted. He was enjoying experimenting with gourmet cooking, and resented the implication that he wasn’t capable of more. Really one of those is just a less fancy version of the mexican mac n’ cheese I make for my daughter sometimes. Boxed organic whole wheat mac, can of black beans, a bunch of diced tomatoes, and taco seasoning. Mmm! I kind of want to make that cookie pie. Cherry-pie filling and Hershey’s syrup? What a rush! My dad’s a PhD chemist and he can burn ice water. You’d think being a chemist he’d be able to cook – but it’s a no-go. I think even this book couldn’t help him. Also chocolate chip cherry pie? GROSS! 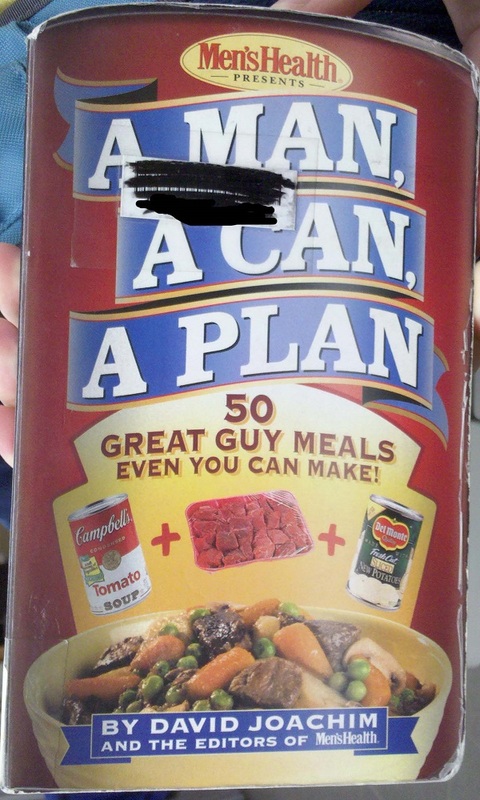 My mom bought me the follow-up “A Man, A Can, A Microwave” (I am a lady, btw) when I moved into an on-campus apartment that only had a microwave and a stovetop. I only tried a few of the recipes but I remember them all coming out soggy and rubbery, and rounding up all the ingredients was deceptively expensive. My brother’s got this book. I can understand how people who do “real” cooking might find the idea off-putting, but I tend to create most of my meals from cans (and I’m female, even) and have no problem with it. I don’t see it as an “awful” book in the slightest unless it isn’t circing. The submitter said she got the book at a library book sale. This implies that it’s already been weeded or is a donation. A donation in a library bookstore may or may not have been evaluated by the staff. The library may already own a copy, or may have a policy not to add books older than a certain date, because of time taken to catalog it. I think you should not include these as entries–it’s not a library book, for one thing. As you can see, lots of people commenting here can see value in it. It’s also not that old. It’s not to my taste, but it’s not bad for a cookbook collection. 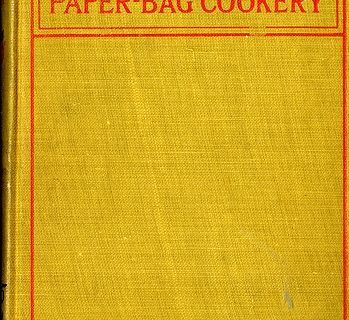 A public library has a variety of cookbooks, and ought to, for that matter–from easy to complex, and usually includes many kinds of cookery. A a public librarian, I think this is not a weeder. Adding things that have funny titles and covers or are things that have already been weeded, or were rejected donations and are sold at the library–what is the point of this? The newest edition of this book is a board book. I ran into while helping at a local school’s book fair. Truly an awful and inexcusable book. It’s for people who think Sandra Lee is too fancy and sophisticated. Guys – I don’t see anything wrong with this book. It is in the grand American tradition of food companies creating recipes using their products. Perhaps you do not remember the little booklets and recipies cut out of women’s magazine adds that your mothers saved in their loose leaf Betty Crocker cookbook. The reason that these kind of recipes work is that these companies have better food scientists working for them than I have in my kitchen. Turn your nose up at it but I see no meaningful distinction between these recipes and ones which call for bottled oyster sauce or fish sauce. 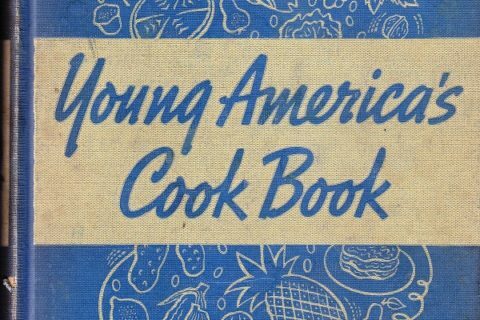 I personally have this book in my kitchen on a shelf between Perla Meyers’ “Peasant Kitchen” and “The Frugal Gourmet Cooks American” (perhaps the creepiest book cover of all times).